- Finished my last Cooking 101 class at ICE last Saturday. Unfortunately, Chef Melanie Underwood was not able to teach the last class. 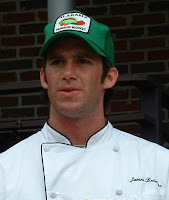 Fortunately, Chef James Briscione stepped in. Besides being devastatingly adorable with a drawling deep voice, he was actually very approachable and did a great job with us newbies. Again, I didn’t learn much in this class that I didn’t already know – I asked Chef James what kind of salt I should use in my pasta water (he answered “kosher”)…but anyone who reads my blog knows that I know darn well what kind of salt to use. Truth be known, I wanted to ask a question to encourage Chef James to speak…and I hoped to show him that I knew what I was doing...because he's really cute. Yep, I’m admitting my crush right here. But back to the food...What I did learn was that “primavera” is Italian for “spring-style” and that you shouldn’t make glazed walnuts on the stovetop because the sugar will burn before the walnuts are toasted (do them in a 350 degree oven for 10-15 minutes). At the end of class, Chef Jane came in and a few of us chatted for awhile. She has a blog as well, over at Wine and Food Philosophy. I hope to take a class from her someday – she strikes me as funny, bright, and down-to-earth.